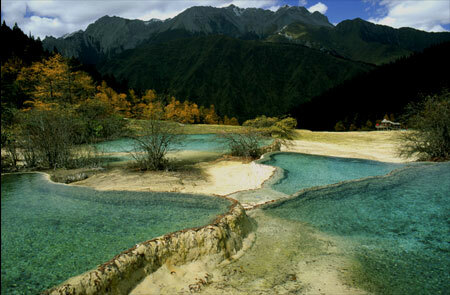 Nature bestows special beauty on HuangLong. Located in northwest of SiChuan province, the scenery of HuangLong (yellow dragon) is worth of the hardships, or at times even dangers, when accessing this place. It abounds with colorful karst pools in the open, there are many different shapes and colored pools, also the temples on the top of the mountain behind, all make the area a great place to explore. It is said by researchers that every one-centimeter of height of growth by mineral deposit on the banks of the pools takes about 100 years.